The United Methodist response to the devastating 2017 hurricane season is getting a boost through new grants from the United Methodist Committee on Relief. During their Oct. 12-14 meeting, directors of the denomination’s Board of Global Ministries and UMCOR approved more than $7 million in grants for hurricane and other disaster-relief work and $1.86 million for global health projects. UMCOR already had received some $15 million from donors in recent months to respond to U.S. disasters. Full-page ads in the Wall Street Journal and New York Times have highlighted the denomination’s commitment to disaster relief and the fact that 100 percent of all donations go directly to relief efforts. Bishop Hector Ortiz, episcopal leader of the Methodist Church of Puerto Rico, normally would have been a part of the Global Ministries meeting. However, given the continuing dire situation there after Hurricane Maria, Ortiz had a brief livestream conversation on Oct. 12 with his fellow directors instead. “The past three weeks have been truly heartbreaking,” the bishop said. “Thousands of families lost their homes.” The Puerto Rican church’s partnership with UMCOR and Global Ministries is of utmost importance, he added. 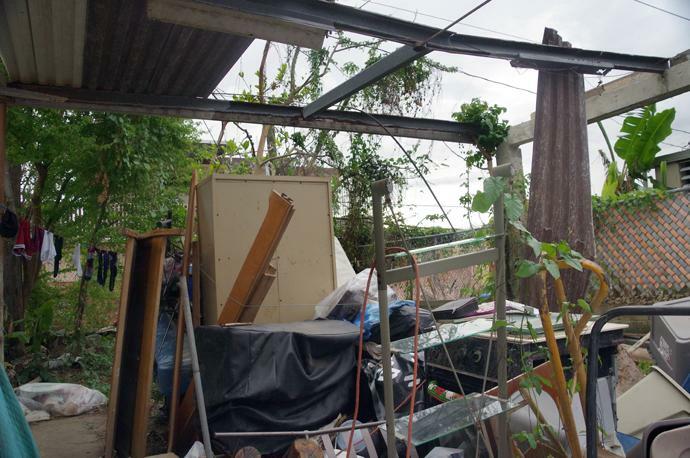 Belongings are piled under the open sky in a building damaged when Hurricane Maria swept over Puerto Rico causing widespread destruction, Sept. 20. Photo by the Rev. Gustavo Vasquez, UMNS. Thomas Kemper, top executive for Global Ministries, announced that Luis Morales, disaster coordinator for the South Georgia Conference, was traveling to Puerto Rico on Oct. 13 as an UMCOR consultant. “They (Puerto Rican Methodists) already have distribution centers in 20 local churches and are trying to stand with the people in Puerto Rico,” he said. UMCOR sent a $100,000 grant to the Methodist Church of Puerto Rico, and assessments are still in process for a larger grant for relief and recovery work. Ortiz finally was able to purchase a generator so the Puerto Rican church office can reopen, Kemper told United Methodist News Service. UMCOR also will look to some of the other island nations affected by hurricanes this fall. Kemper is counting on the fact that UMCOR held a training in March for Methodist-related disaster coordinators in Central America and the Caribbean. “This has become a very good opportunity for us to reach out now to these partners,” he said. Several of the larger grants approved during the Global Ministries meeting relate to Hurricane Harvey, which dumped 40 to 52 inches of rain and caused catastrophic flooding in southeastern Texas and part of Louisiana, and Hurricane Irma. 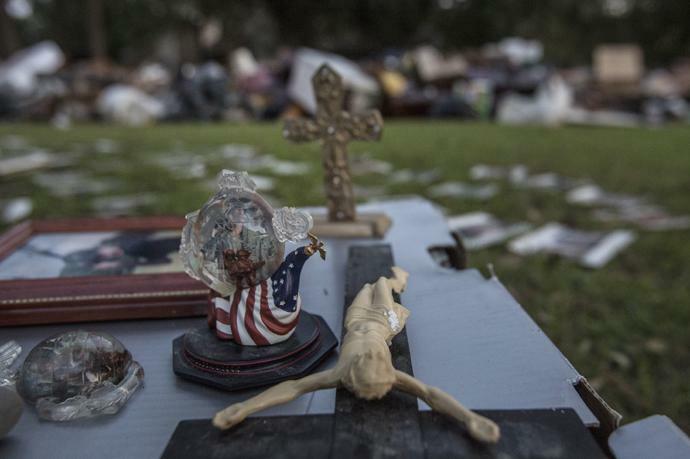 Items laid out to dry from flood damage from Hurricane Harvey. Photo by Kathleen Barry, UMNS. The denomination’s Texas Conference includes Houston and at least 20 of the 39 counties falling under the disaster declaration by the Federal Emergency Management Agency. The Texas Conference will use its $1 million grant for the first phase of a long-term recovery process to assist 300 households. Fourteen counties in the church’s Rio Texas Conference were affected by Harvey. Rio Texas will use its $816,418 grant to support two field offices and one satellite office for initial recovery efforts. A “volunteer village” is expected to open by Nov. 1 at First United Methodist Church in Sinton, Texas. Louisiana has received no FEMA assistance for flooding caused by the downgraded Tropical Storm Harvey. A $500,000 grant will allow the Louisiana Conference to “fast-track recovery operations,” UMCOR said. Winds, rain, flooding and loss of power caused by Hurricane Irma had a widespread, catastrophic impact on Florida. A $1 million grant to the Florida Conference will initiate the church’s long-term recovery operation with the establishment of five regional centers. Molly McEntire, an UMCOR director from Florida, shared her experiences as one of the volunteers staffing a call center set up by the conference. Nearly 250 United Methodist churches filed claims for hurricane damage and individuals who called the conference for help were paired with a local church in their area, she said. Last year’s disasters also got continuing attention from UMCOR. Receiving grants for Hurricane Matthew Phase 2 recovery were the North Carolina Conference, $1.25 million, and the Virginia Conference, $250,000. Louisiana received $720,000 for its continued response to the widespread flooding in August 2016 and the West Virginia Conference received $750,000 for long-term recovery from June 2016 flooding. Other grants included $350,000 to Mennonite Disaster Services to assist the Oglala Sioux Tribe of Pine Ridge Reservation in South Dakota, after storms and flooding in May 2015. An international grant of $423,899 went to the Mines Advisory Group, which is clearing landmines in Iraq so that displaced populations can return to their homes. Most of the $1.86 million in grants from the Global Health unit of the Board of Global Ministries was directed to United Methodist health boards in Sierra Leone, Nigeria and the Democratic Republic of Congo. The Sierra Leone Conference also received $613,209 for an Imagine No Malaria Project and Global Refuge, an organization working with South Sudanese refugees in Uganda, was given $118,852 for emergency medication and supplies.